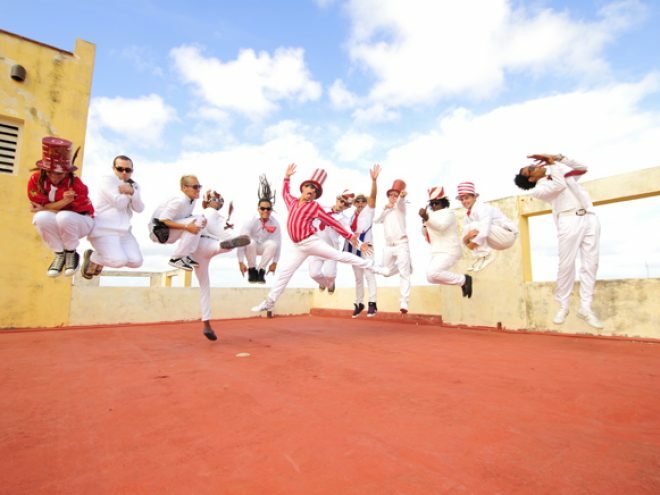 If 2011 belonged to anyone in the alternative rock fusion scene in Cuba it was to Qva Libre. This wildly energetic and committed 10-piece band deservedly swept the boards, winning TV and music business prizes galore, not to mention recording offers from both on and off the island. They also built up such a following that they now regularly fill the favoured Saturday night spots at some of the most popular fusion venues in town. What they have come up with is definitely something new and very fresh, and performed in an irrepressibly funny and exciting way, with 100% high octane energy. But it was a very tough, long and winding road getting to this point – over 10 hard years – and there were moments when (simply for lack of enough food on both lunch and dinner tables) they thought they would have to pack it in completely. The band began life in 2000. Four musician friends were looking for a way to mix their love of various genres (especially rock, rap and funk) with the roots and rhythms of Cuban music. Early forays were marked by very mixed receptions; a mainly rock audience were not too amused by their particular fusion or high-spirited style. Later, as groups like Interactivo were at their peak, and as a more alternative scene developed in Havana, a small but increasing space began to open up for the band – then, as now, led by bassist/composer/arranger, Carlos Diaz. Renowned producer Juan Antonio Leiva also got involved, supporting them in various recording and performance projects. Despite great public enthusiasm for their music, however, they produced their first demo – in 2004 – out of their own pockets. 2005 brought further stability and saw collaborations with many well-known younger musicians such as Telmary, William Vivanco, Interactivo and Kumar, as well as an appearance in the film, Habana Blues. But still, in spite of their impressive work and development (appearances all over the island, a substantial and growing fan base, appearances on TV and radio, and collaborations with the Who´s Who of Cuban music), Diaz and Qva Libre were struggling to keep the band together. Many times – and right up until early 2011 – they lacked the money to even eat, let alone buy new guitar strings, replace a broken mic or record their work. Furthermore, the quality of musicianship in the group led to many of them being offered (and a few, accepting) lucrative deals to play in other bands. There was also the inevitable issue of migration. But with some new and very committed members onboard the passion, stamina and dedication have finally borne fruit. 2011 saw them run away with two prestigious prizes – Cuba Disco and Cuerda Viva – for their CD, Viva Qva Libre. Their mainly young (and alternative) public always loved them but, now, doors that were previously shut very tight, opened (and are still opening) as radio and TV producers clamoured for a piece of the action. Aside from all this new and rather heady success the heartening thing about Qva Libre is that they are very tight (good friends) and very nice people indeed. They are also friends with their public – who have stuck by them, and believed in them, through thick and very thin – and enemies of conformity and comfort. This is a good creative combination, and a good recipe for future evolution, from an outfit who have dedicated the last 12 years to playing when no one much was listening. It’s a great relief, then – for them and us fans alike – that Qva Libre have finally ´´arrived´´ and, what’s more, don’t seem to be thinking of going any place else. Their present, and compelling, line-up boasts two exuberant vocalists (Lenier Vera and Miguel Angel), drummer (Marlon Marrero), a whacky and tight four piece sax/trumpet section, lead guitarist Alejandro Inpante, Rafael Evora (new, on keyboard), plus their ever-dynamic director, Carlos Díaz, on bass and sax. Visually great. Musically as hot as it comes. Don´t be square – just be there!